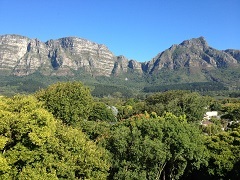 Arrived in Cape Town at the end of a heatwave and the beginning of Test Cricket. We seem to be sharing the first hotel base for our South African wine tour, the appropriately named Vineyard Hotel in leafy Newlands, with a colourful crowd of Aussie cricket fans here for the Newlands Test – never seen the hotel so busy. Quick stop at Kirstenbosch Botanical Gardens nearby, looking very dry and parched post heat-wave, to inspect the flora & fynbos. 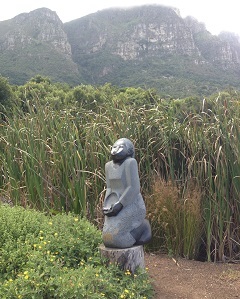 Loved their sculpture garden and Protea Garden. Celebrated the start of our wine tour with a welcome dinner at The Square restaurant as our tour participants gathered from all over the world: UK, South Africa, Australia and Hong Kong. Most popular wines of the night: barrel fermented Cederberg Chenin Blanc 2011 from high altitude vineyards in Citrusdal (£11.99 SA Wines online) and iconic rich Vin de Constance 2006 with its toffee apple notes & faint hint of fynbos (£35 for 50 cl bt Majestic Wine). Incredible weather for our trip to Cape Point. Quick viewing of penguins from the new Boulders gallery, followed by a sprint to the tip of Africa (see picture below). 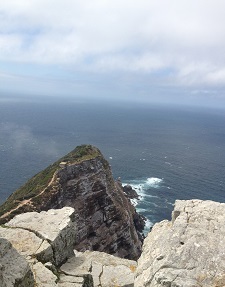 Our Aussie friends suitably astounded by the beauty of Cape peninsula already. Twenty minutes from Cape Point is the new Cape Point Vineyards in a stunningly beautiful, but very exposed position, nestled under the foot of Chapman’s Peak and above one of Cape’s most beautiful beaches in Noordhoek. Laid back tanned surfer/winemaker Duncan Savage has worked these granite-based maritime vineyards for ten years and knows what works best here now. “Sauvignon Blanc is our main variety, it doesn’t mind the wind; also have Semillon and a hectare of Chardonnay”, says Savage. “We pulled out our 4 hectares of Pinot Noir”. Savage, whose new winery was crafted out of an old mine bunker, is like many Cape winemakers, now experimenting with clay amphorae and stoneware jars of Stellenbosch clay: “stoneware respects the fruit”, he says. Favourite wines from Cape Point Vineyards tasting in their tented tasting room: fresh vibrant sleek Sauvignon Blanc Reserve 2012 (87% Sauvignon Blanc/13% Semillon: 14 months in 600 litre barrels) Isliedh 2012 (75% Sauvignon Blanc/25% Semillon: 50% new oak) very intense and sleek “from our ugliest vineyard and its low vigour vines” says Savage. As it was a Sunday, Cape Point Vineyard site was heaving with Cape Towners enjoying the sun. Despite having emailed their restaurant/bar on numerous occasions over the past few months - booked, paid for our tasting/platters/picnics and reserved seating in advance - the service was a total shambles. Had to wait two hours for food. The administration side of this tourism operation seems to be appalling, but they have good wines (thanks to Savage), decent food (when you get it) and it is an awesomely beautiful place. Get your act together guys! The enchanting Klein Constantia homestead was under major construction, so our visit focused on the winery with a quick history lesson from Alan Wickstrom on the original Constantia estate (1,000 hectares before it was divided) from first owner Governor Simon van der Stel through to socialite Clara Hussey, the Jooste family who renovated the estate in the 1980’s to present day owners (Frenchmen Bruno Prats & Hubert de Bouard, Englishman Charles Harman and Czech Zdenek Bakala) who are clearly investing heavily to upgrade this spectacular estate. We toured Klein Constantia vineyards, to see current soil erosion prevention project at first hand on steep Constantiaberg slopes, new drainage and baboon fences. Expansion plans (currently 58,000 bottles – planning to increase to 100,000 bts). Favourite wine of the tasting: enjoyed the wild berry fruits of Klein Constantia Shiraz 2010 and fine tannins/good depth in Anwilka 2008 (Shiraz, Cabernet Sauvignon & Merlot blend). Not quite as excited about KC’s range as I have been. Next stop the family-owned boutique Buitenverwachting Estate (which translates as ‘beyond expectations’) to meet owner Lars Maack. His father, from Hamburg, bought this estate 35 years ago in a pub “very cheaply”, but had no background in wine. Lars decided to focus on quality, now majoring on Sauvignon Blanc, Semillon and Chardonnay which Constantia region does so well on his currently planted 105 hectares. Favourite wine of our tasting: Buitenverwachting Hussey’s Vlei Sauvignon Blanc 2013 (£12.50 Swig). Marathon ten course tasting menu in Buitenverwachting’s elegant new restaurant took several enjoyable hours: topped with their flagship red: smoky tobacco scented Christine 2009 (£19 Emp Wines; SA Wines online) named after Lars’ mother. Morning visit to one of my favourite Cape wineries: the grand old Rustenberg (pictured right) 1,000 hectare estate on the lower slopes of Stellenbosch’s Simonsberg in Ida’s Valley, now next to its new glamorous neighbour Glenelly winery, set up by May-Elaine de Lencquesaing of Chateau Pichon Lalande (love her Lady May flagship wine, by the way). Slight wrong turn mid-estate in Rustenberg meant we had an extra viewing of the Barlow’s private home and gardens at Schoongezicht. Vineyard tour of Rustenberg’s 110 hectares current planting with young Murray Barlow, recently returned from Adelaide (learnt about Grenache & handling grapes in warm temperatures), enlighted us on recent ventures with winemaking consultants to improve Rustenberg. Favourite Rustenberg wines in our tasting: rich fat plump Cabernet Sauvignon/Merlot/Petit Verdot/Malbec blend John X Merriman 2011 (£14.99 Waitrose, Majestic); 100% Cabernet Sauvignon Peter Barlow 2007 (£22.99 SA Wines online). 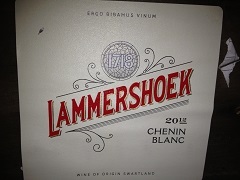 Our tour group also loved the elegant fresh apricot/peach scented Rustenberg Straw Wine 2012 (Chenin Blanc/Viognier/Crouchen Blanc) judging from the number of purchases after the tasting. Another historic Stellenbosch winery visit at Kanonkop estate, who were still recovering from a fire which had burnt out their administration offices. Mid-harvest and clearly very busy with renovations, 4th generation family owner/ex-lawyer Johann Krige (pictured), his wife Marie and daughter could not have been more generous with their time. Johann gave a very professional tasting including his views on Pinotage: “a difficult variety: you need big balls to work with it”. Favourite wines of the tasting: mature earthy Kanonkop Pinotage 2003, the spicy lush rich Kanonkop Cabernet Sauvignon 2010 (£22 Majestic Wine) and coffee/cocoa/fine tannins of Cape Winemaker’s Guild Auction Paul Sauer 1997. Krige’s traditional legendary snoek braii for lunch (with traditional soetpatat and potbrood) with older vintages Kanonkop Pinotage 1997 and Paul Sauer 1991. Our next stop was in stark contrast to our morning visits. 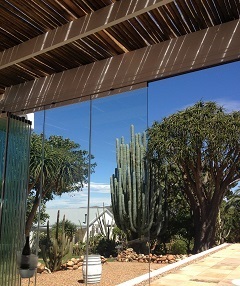 Tokara has a bold hilltop location above Stellenbosch with vineyards tumbling down below the modern concrete edifice. 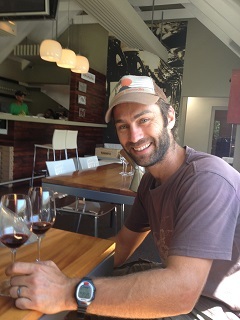 This new winery is very lucky to have one of the most talented winemakers in the Cape at the helm: Miles Mossop (pictured). An inspirational guy who needs no prompting for information and genuinely wants to improve his wine quality eager to hear about winemaking around the world. A big tasting of their Reserve Collection from Tokara’s vineyards in Stellenbosch, Walker Bay and Elgin: favourite wines of our tasting: Tokara Elgin Sauvignon Blanc 2013, Tokara Director’s Reserve 2012 a barrel fermented Sauvignon Blanc (74%)/Semillon (26%). Personally the wines I thought really shone out were Mossop’s own wines: Saskia, Max and Kika. Three delectable wines named after his three children. Saskia 2011(£18 Swig, SA Wines online) was one of my favourite white wines of our entire South African tour. This white ‘mediterranean blend’ is led by 66% Chenin Blanc for acid (with 26% Viognier for aroma, 3% Clairette for texture & 5% Verdelho for weight from Stellenbosch, Swartland and Paarl fruit). Just beautifully balanced, gently toasty with sumptuous fruit finishing dry. 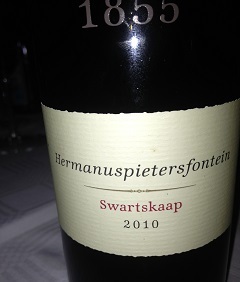 A stunning wine. Mossop’s Max red is a sturdy Bordeaux blend with silky tannins and his sweet 100% Chenin Blanc Kika (£14.99 hf bt SA Wines online) is just charmingly fresh with layers of sweet fruit. 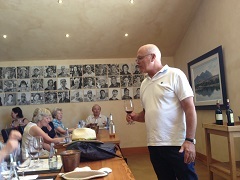 Scenic coastal drive from Stellenbosch to Hemel-en-Aarde to visit Hamilton Russell Vineyards, with owner Anthony (pictured) now a veteran in Hemel Valley with 22 years on his Hermanus estate. Mid-harvest on all three of their properties: Ashbourne, Southern Right and Hamilton Russell – Anthony still had time to give us an excellent introduction, his own personal views on the state of South African wines and hours of his time. Clearly another Cape estate trying out interesting new maturation methods, he also has a row of new amphorae in the cellar - where we enjoyed an enlightening tasting. Favourite wines: Ashbourne 2007 (82% Pinotage, 9% Cabernet Sauvignon, 9% Syrah all vinified separately) “with Pinotage here more like Grenache”, explained Anthony. Hamilton Russell Pinot Noir 2011 tasting very feminine, soft and rounded and Chablis-like Hamilton Russell Chardonnay 2013 showing beautiful purity of fruit. Lunch with the Hamilton Russell’s at Braemar, their suitably stylish home with stupendous views overlooking olive groves and vineyards was memorable for all. Olive Hamilton Russell (pictured) practising her delicious recipes for her contract for three cookery books; her honey, lemon, passionfruit & coconut ice cream cake was truly divine. 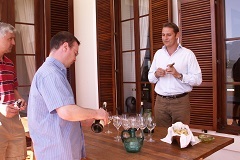 Their outstanding generosity & quality of their wines won Hamilton Russell the Best Visit of our trip award. 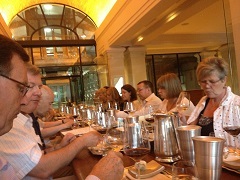 Next stop – and a little jaded after such an amazing lunch – we headed to Bouchard Finlayson. Peter Finlayson, once winemaker at Hamilton Russell next door, set up with Frenchman Paul Bouchard in 1989, sold out in 2000 to Red Carnation group of hotels - but still works as winemaker here. Shy and retiring Finlayson is extremely knowledgeable about all things South African once he gets going – and also clearly loves Italian grapes. Enjoyed his Sauvignon Blanc 2013, oaked Crocodile’s Lair Chardonnay 2013 and fascinating briary-fruited Sangiovese-led 6 part blend of Italian & French grapes in Hannibal 2012 – before our twisty drive up through Elgin behind numerous slow moving apple carts - over the pass to Franschhoek, our next base. A hot & humid February day for our morning visit to one of my favourite Cape wineries, Boekenhoutskloof, now in its 20th year. Jean Smits (pictured), Marc Kent’s extremely able assistant, gave up hours of his time mid-harvest to show and explain everything from vineyards, importance of concrete egg-shaped tanks (“we love concrete”) and new foudres at their Franschhoek cellar. Interesting to hear Kent & Smits' views on the next region to watch in the Cape: “Citrusdal is really exciting; Grenache thrives here” says Marc Kent. Epic tasting in their swish upgraded tasting room: Boekenhoutskloof Semillon 2004 with its distinctive seven chairs label was deliciously waxy rich and honeyed shone out amongst the whites. Favourite premium reds were meaty Swartland Syrah led blend Chocolate Block 2012 (£18 The Wine Society) – and not surprisingly, cedary silky & very fine Boekenhoutskloof Cabernet Sauvignon 2011 (100% new French oak; £30 SW Wines online). My all-time favourite Cape Syrah showing well with mature mellow rounded Boekenhoutskloof Syrah 2006 (£27.99 Waitrose). Plenty of bargains here too with Wolftrap Viognier/Grenache Blanc 2013, Wolftrap Syrah/Grenache/Mourvedre 2013 (£6.95 The Wine Society) and Porcupine Ridge Syrah 2013 (£6.99/£8.99 Majestic Wine). Across the valley on the eastern slopes of Franschhoek, up at high altitude Cape Chamonix we met up with their winemaker Gottfried Mocke in the converted C18 Blacksmith’s Cottage. This estate has a long history, originally part of La Cotte, one of the very first farms granted to the Hugenots in the 1880’s. Current owner German Chris Hellinger has revitalised the wine estate since he bought it in 1991 – now with 50 hectares under vine with some of the highest planted vines in the Cape today. 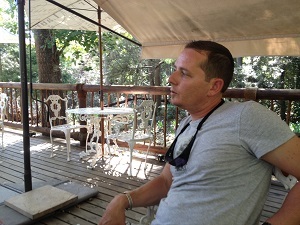 Hellinger’s appointment of Mocke as winemaker a decade ago was inspired – as Chamonix has seen an unpredecented growth in quality (Platter’s SA Winery of the Year 2013). Chamonix range of wines all showed well at our tasting with Mocke - from Chardonnay (£14.95), Chardonnay Reserve (£17-£18 Raeburn Wines), Pinot Noir Reserve through to the fascinating Pinotage (see My Latest Find) now available at £16 in The Wine Society. Came away seriously impressed with Cape Chamonix wines, particularly their Pinotage – and Mocke himself - who really thinks out of the box when it comes to winemaking challenges. He blends early picked Beaujolais style Pinotage grapes with very late picked dried: so combines Beaujolais and Amarone techniques to get the best out of this awkward rustic grape: genius! Outstanding praise from our whole group: “we loved every single wine in Cape Chamonix’s range” and for Gottfried’s fascinating chat – won them the second place in our Best Winery on the Tour Award. Quick change for an evening tasting and dinner at the rather splendidly proportioned historic La Motte in Franschhoek. Interesting for me to visit after a gap of 15 years, as it has now refined itself into a flourishing and heavily marketed wine tourism destination complete with its Pierneef Restaurant and Farm shop. 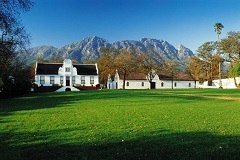 La Motte is still owned by the Rupert family who acquired it in 1970, now run by son in law, Hein Koegelenberg married to Anton Rupert’s daughter Hanneli. La Motte has just expanded its vineyards to 75 hectares of vineyards in the Bot River area where they will major on Sauvignon Blanc, Shiraz and Cabernet Franc alongside existing 75 hectares (organically farmed) in Franschhoek (Chardonnay, Cabernet Sauvignon and Semillon) – and have delisted as an ‘estate’. 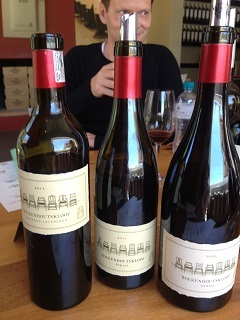 Winemaker Edmund Terblanche (who has been at La Motte since 2000) has an elegant touch particularly with their reds. Our tasters (see picture tasting at La Motte winery) enjoyed the mocca, blackcurrant and dark chocolate notes of La Motte Cabernet Sauvignon 2010 (14%) and the lush liquorice La Motte Shiraz 2010. Dinner in the lavishly decorated Pierneef restaurant with its porcelain plate chandelier and open kitchen was largely disappointing, considering the hype: Pumpkin Flowerpot lacking seasoning, Crown-roasted chicken acceptable but nothing remarkable and an eclectic peppermint meringue, raspberry sorbet and Valrhona nazelnut Ivoire cluster dessert with disappointing Leopard’s Leap Muscat de Frontignan 2013. Best wine of the night: deliciously mature La Motte Cabernet Sauvignon 2003. No sign of busy CEO Hein, so his chair remained empty at our table all evening. From the precisely manicured corporate lawns and chic tourist boutiques of Franschhoek, we headed to the current hotspot of Cape winemaking, the rugged idyllic beautiful rolling hills of Swartland. This outpost north of Paarl is currently hitting the headlines with some great winemakers like Adi Badenhorst of AA Badenhorst Family Wines, Eben Sadie of Sadie Family Wines, Craig Hawkins at Lammershoek and Chris Mullineux at Mullineux Family Vineyards leading the way. For those who love space, tranquillity and a feeling of getting closer to terroir and nature – this is your place. 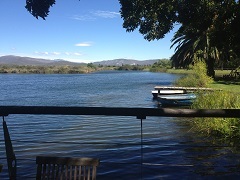 I could definitely live in Swartland! Tasting and lunch at the Kretzel family farm of Lammershoek on Swartland’s Perdeberg; the Kretzels (from southern Styria in Austria) have been here since 1995. 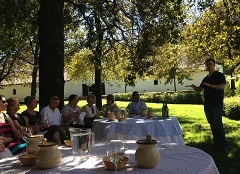 A relaxed tasting (pictured) outside the family’s ranch-like home, sheltering between rainshowers, with the charming young Carla Kretzel who talked us through their organically produced, natural wines. “Unpretentious, unassuming and simple” (no new wood, no enzymes, no added yeast) is winemaker Hawkins’ motto (he trained with Eben Sadie) – and it shows in his wines. 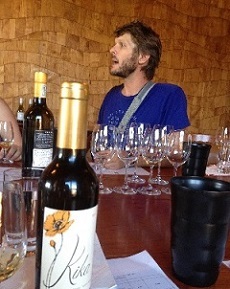 Chris Mullineux busy with harvest deadlines, so Carla Kretzel kindly integrated his wines into our tasting too. Enjoyed fresh vibrant intense Mullineux Syrah 2011 from schist vineyards and the honeyed rich Mullineux Chenin Blanc Straw Wine 2012 – available now from Berry Bros & Rudd www.bbr.com. Stopped off in enchanting Riebeek Kastel, one of the oldest towns in South Africa nestling beneath the Kasteelberg mountains. Checked out Mullineux boutique cellar and discovered a treasure trove in the wonderfully well-stocked WineKollective www.thewinekollective.co.za in Short Street – an excellent new shop offering a wealth of Swartland wines – where we stocked up on Badenhorst, Sadie wines and more to continue Swartland homework. Quick tour of city sights from up Signal Hill to downtown Waterfront, followed by an excellent dinner at one of Cape Town’s best restaurants, Aubergine (39 Barnet Street, Cape Town www.aubergine.co.za) Fourteen wines accompanied by a multi course extravaganza, which was claimed by our tour participants to be the best food we had eaten in the Cape. Most impressive of the white wines at dinner: creamy nutty Paardebosch Phoenix 2011 (barrel fermented 60% Semillon/40% Chenin Blanc), beautifully mature Paul Cluver Chardonnay 2003 (CWG Auction) – and a surprise find in Hermanuspietersfontein Swartskaap 2010, a soft raspberry-toned leafy Cabernet Franc – which tasted like a ripe Loire red in a good vintage. Finished with a deliciously toffeed Tierhoek Straw Wine 2006. 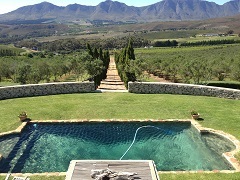 An enchanting visit to one of my favourite Cape estates, Springfield in Robertson. 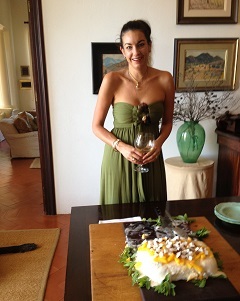 Jeanette Bruwer had kindly driven across Africa after a late night wedding to host our tasting on a Sunday morning. Her family, the Bruwers, can date their family history here back to 1688. Jeanette, who is actually a trained GP (“you never know what life may throw at you”), runs this fine estate with her brother Abrie: this hard-working duo really know their land well. I had always thought of Springfield as a white wine dynamo with their fine Life from Stone Sauvignon Blanc, Special Cuvee Sauvignon Blanc 2013 and sublimely delicious Methode Ancienne Chardonnay 2009 – but I was proved wrong. We were also really impressed with the Springfield reds. Whole Berry Cabernet Sauvignon 2012, approachable softly tannic Bordeaux blend The Work of Time 2008 and the Pomerol-like lush plummy Methode Ancienne Cabernet Sauvignon 2006. Stocked up with enough bottles of Methode Ancienne Chardonnay and The Work of Time to see us through our next week’s tour as we headed east away from the heart of Cape wine country. Lunched at Mo & Rose bistro in Robertson (highly recommended for a quiet Sunday lunch amongst the cactii; good food & winelist) – before we set off on the second part of our Cape instalment heading east to discover the Congo Caves & feather palaces of arid Oudtshoorn – and the retirement-ville Garden Route centres of Plettenberg Bay and Knysna.